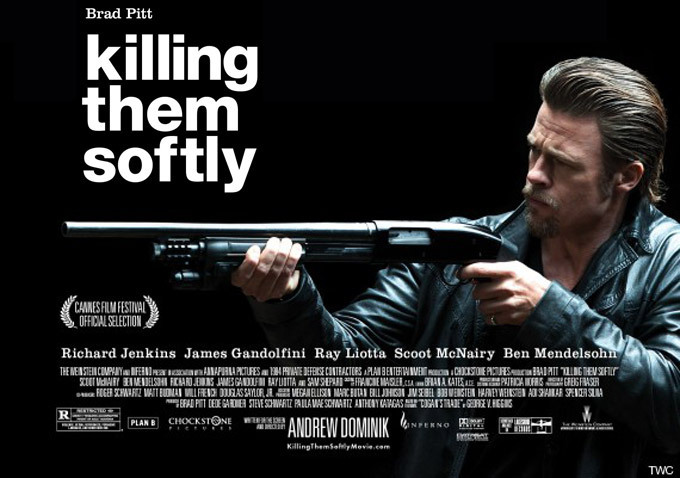 ‘Killing Them Softly’ not only is a brilliant and intelligent crime yarn, which will fulfill your violence, gore, and character levels, but also from beginning to end has a political and social undertone that makes this modern crime noir film much more than it looks to be. It’s been several years since Andrew Dominik made a film. His last film was the impressive ‘The Assassination of Jesse James by the Coward Robert Ford’ in which Brad Pitt starred in. 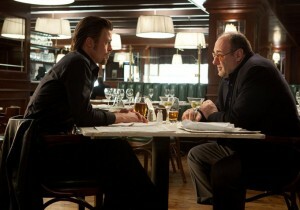 Well Pitt is back and even better than ever in ‘Killing Them Softly’. In this virtual all male cast and based on George V. Higgins’ novel ‘Cogan’s Trade’ takes place a few weeks before the 2008 presidential election in New Orleans. But don’t expect to see the fun, touristy sections of New Orleans, but rather the seedy and at times frightening parts of New Orleans. As the film starts out, we hear an off camera voice of Barak Obama talking about change and moving forward with America with every American capable of the American Dream. We cut to an older greasy man Johnny Amato (Vincent Curatole, know for the iconic role o Johnny Sak from ‘The Sopranos’), who seems to be some sort of boss in an organized crime venture. 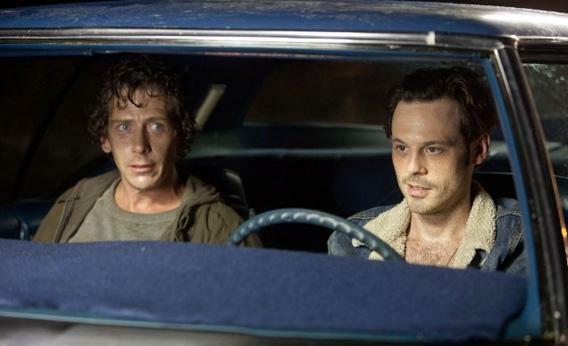 He wants to hire a pair of dirty, degenerate, and drug addicted idiots, Frankie (Scoot McNairy) and Russell (Ben Mendelsohn) to do a job of robbing a local card game where a lot of mafia bosses shell out tons of money. 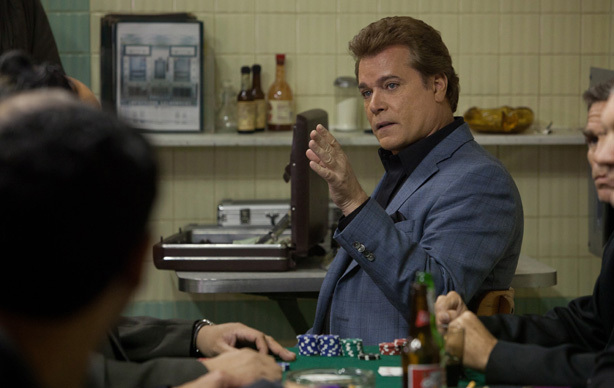 The card game is run by Markie Trattman (Ray Liotta), who a few years before robbed his own game, but since he was so likable, he got away with it. Even with Frankie and Russell’s incompetence, they actually pull off the robbery, making everyone think that Markie robbed his own game again, and leaving Amato in the clear. However, due to the robbery, the card games have stopped, which has put a serious kink in the money system for a few crime families. One of the higher ups in the mob, who seems to be a straight laced corporate guy who goes by the name of ‘Driver’ (Richard Jenkins), hires a hitman Jackie Cogan (Brad Pitt) to find out who robbed the card game and deal with them, as to not further delay any more money coming in from these card games, so business can get back to normal. As Cogan thinks there might be more than just Markie in on this robbery, he enlists the help of a fellow hitman Mickey (James Gandolfini), who over the years has become a belligerent and angry drunk who babbles on about this and that to help with a double murder. This is basically a film with no protagonist. Everyone involved has done something deplorable, so it doesn’t quite hit you emotionally when some of these characters meet their ultra-violent demise. What sets ‘Killing Them Softly’ apart from other crime/mafia films is the style and vision of the film and characters, which is attributed to Dominik. From the Tarantino-esque dialogue to the amazing camera movements, this film is more of an art piece than a violent mafia movie. When Russell injects heroine into his system, the camera goes in and out of consciousness and the audio muting and coming back to full force. It really puts you in the center of everything. Even the soundtrack goes as far as to tell a story as Cogan drives around to his next victim to the sound of Johnny Cash’s ‘When The Man Comes Around’. Like I said above, the dialogue us very intelligent and I wouldn’t be surprised if this film received a Oscar nod to best Screenplay. As for the constant subtext of the film through out the film, which it begins and ends with, are the final debates between Obama and McCain from 2008, in which they go over a variety of topics. Mainly having to do with the economy, which even we are hit over the head with, when the actors start feeding us on a silver platter the subtext in that if you can’t fix your money problems, bad things will happen, as we have seen in this country over the past several years. ‘Killing Them Softly’ delivers the goods on every possible level and I hope it isn’t too long before Dominik makes another film. 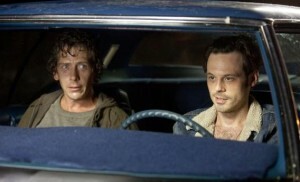 ‘Killing Them Softly’ Blu-ray Announced and Detailed!!! Film Review: ‘The Place Beyond the Pines’!!! This entry was posted on Friday, November 30th, 2012 at 11:59 am	and is filed under Film, News. You can follow any responses to this entry through the RSS 2.0 feed. You can skip to the end and leave a response. Pinging is currently not allowed. « ‘Flight of the Navigator’ Remake Is Happening!!! [solemnly] My prayers be with him. Best not wallow in our grief!